home » Press Brake Productivity » Knowledge Center » H. Tool alignment along Tx (and Ty) axis. The accuracy of the bending process is determined by the accuracy along the Tx and Ty axis, i.e., vertical and horizontal tolerances in the press brake and tooling. 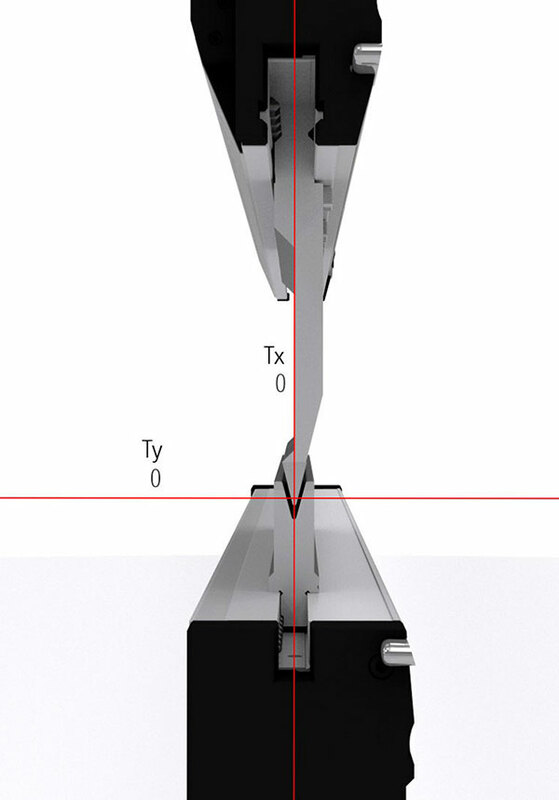 The Ty axis value is decisive in determining the parallelism between punches and dies. The Ty axis adjustment, which is normally incorporated into our Crowning Systems and Bottom Tool Holders, is able to easily and effectively correct accumulated machine tolerance across the length of the whole machine. This is extremely important as far as quality is concerned, but is also a factor that can help to significantly extend the life span of press brakes. The Tx axis value relates to the location of the tooling center position in relation to the back gauge, which is critical for producing accurate flange lengths. The Tx axis adjustment has been included in all Crowning systems and Bottom Tool Holders suitable for press brakes featuring the UPB (Universal Press Brake) hole pattern. Alignment corrections along the Tx axis are normally only used during the installation process.